A pleasant smelling cream which uses patented ingredients to help sooth, moisturize and maintain healthy joints and muscles for an active lifestyle. 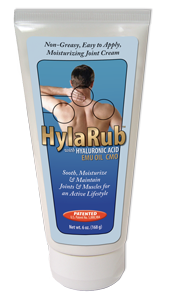 hyaluronic acid(HA) and Cetyl Myristoleate(CMO) for their ability to lubricate joints and Emu Oil to penetrate deep into the skin tissue. There are many ways to use HylaRub™, these are just a few. Water, Cetyl Myristate, Cetyl Oleate (CMO), Emu Oil, Emulsifying Wax, Glycerin, Stearic Acid, Cetyl Alcohol, L-Arginine, Peppermint Oil, hyaluronic acid, Lactoperoxidase, Glucose Oxidase, Glucose, Capsaicin.